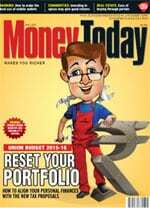 Money Today Managing Editor Sarbajeet K Sen discusses tax proposals in Budget 2015 and tells you why you should buy the magazine's April issue. The first full Union Budget of the Narendra Modi-led National Democratic Alliance government for the financial year 2015-16 did not create much of a stir in the equity market. Though expectations were high on reforms and easing of personal income tax provisions, Finance Minister Arun Jaitley stayed away from announcing any market-moving provisions and focussed on strengthening the framework for the economy. The stock market has been lukewarm since February 28 with the BSE Sensex slipping nearly 800 points from 29,411 at opening of trading session on Budget day to close at 28,622 on March 17. Trading on Budget day itself was lacklustre with the Sensex closing a shade lower at 29,311 after reaching an intra-day high of 29,560. However, though there were no big-bang announcements that the market could lap up, there have been several changes in personal income tax provisions that can benefit the salaried class. If utilised in full, a salaried person in the highest 30per cent tax slab can save an additional Rs 24,596 a year in taxes. Among these is an additional deduction of Rs 50,000 for investment in the National Pension System, which can result in tax savings of Rs 15,450 a year. The deduction limit on premium paid for health insurance has been increased and the recently launched Sukanya Samriddhi Yojna aimed at providing a corpus for education and marriage of the girl child has been made totally tax-free. With an attractive tax-free return of 9.1per cent this could be a good avenue to save if you are a parent of a girl child. Other than tax provisions, there are new schemes such as the Gold Monetisation Scheme and the Sovereign Gold Bond Scheme that you could avail of to optimise your personal finances. Our cover story starting on page 20 dissects all these measures and tells you how you should tweak your portfolio to optimise your tax savings the next year. While the equity market has been moving sideways since the Budget, the long-term prognosis is that it would gradually inch up to new highs. The government's thrust on infrastructure with increased allocation of Rs 70,000 crore would help the economy move ahead and the stock market to tag along. Sectors such as engineering, capital goods and cement could benefit from the higher spending on infrastructure. In our cover segment on Budget impact on the stock market we analyse these sectors and bring to you some investment ideas that could make you richer in the days to come. If you are an avid equity investor and are looking for cues for stock selection, read our story on the investment strategy of celebrity US hedge fund manager Joel Greenblatt. We bring you stocks in the Indian equity universe that fit into his criteria for picking stocks. There are some interesting names in the pack.